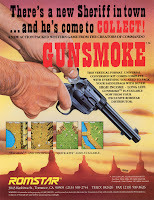 Hello, I enjoyed reading how you put together this Gunsmoke video game from Capcom. It is a great game, one of my favorites from the 1980's. I remember that I was the best player in the neighbourhood in Boston, MA. I had the best high scores!!! I cannot remember the scores but I think it was of 1,500,000 !!! Great job finding all the parts and great patience. I would to own one day one of this coin-op video arcades. Thanks Alfred, Wow a score of 1.5mil is great! I'm now currently the World Record holder for Gun Smoke both in MAME (1,896,250) As well as the real arcade version finally set on this dedicated machine (2,247,650).